- It can be used within a large temperature range and are generally laid outside. - Used for interconnection of solar panel to solar inverter. The Accessories have high compatibility Range. They are suitable for a wide range of security and access control applications, including security control panels to Smart card or biometric readers, locks, Request to Exit buttons, door phones and other low voltage power & data communication applications. “SOLOX Cables are flexible Single Core Cables. Temperature range -400C to +900C (+1250C Peak). Robust and Resistant to High Temperature, UV, Damp heat, Ozone and have excellent weather – proofing characteristics. Multi Core Cables can be provided. For catering the variegated needs of our clients, we are deeply engrossed in offering a qualitative array of DC Wire And Cable. We are offering Solar DC Cable to our client. 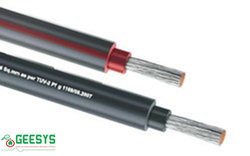 This DC Core Cable has a Dc moulded cord for solar equipments.